Ice dancing pair Min Yu-ra and Alexander Gamelin, who represented Korea at this year's Winter Olympics in Pyeongchang, have ended their skating partnership of three years. Gamelin wrote on his Instagram account on Wednesday that Min had ended their partnership. "It is with deep regret and sadness that I must inform you that although I was committed to representing [Korea] through the 2022 Beijing Olympics, Yura has decided to end our 3-year ice dance partnership," he said. U.S.-born Gamelin, who has paired with Korean-American Min since 2015, acquired Korean citizenship last year to compete at Pyeongchang. They gained a huge following through the Olympics and had been preparing for the 2018-2019 season. In response to Gamelin's post, Min on her Instagram account accused him of laziness in recent months to the extent that their coach warned him to improve. 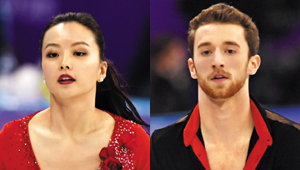 She claimed he had not worked hard and entered the rink without "pre exercise" until just a few weeks ago, so she told him that if he continued to be "tardy" they would remain at the bottom of the rankings, and that it would be better to quit. Of the support funds raised online following the Pyeongchang Olympics, Min wrote, "Gamelin's parents started raising funds, and they have all the money. I don't know how the money is being used." The pair raised money for their training via a crowd-funding website. They eventually raised US$124,340, exceeding their goal of $100,000. President Moon Jae-in and his wife contributed $1,000. Min later deleted her posts, saying Gamelin had asked her to do so, but he posted another message on Thursday. "Everything Yura has said about me today is a total lie, and I have the evidence to prove it. Yura and her family are slandering me to save face… the funds were distributed according to an agreement between our two families," he said. Gamelin also deleted his message soon after posting it.